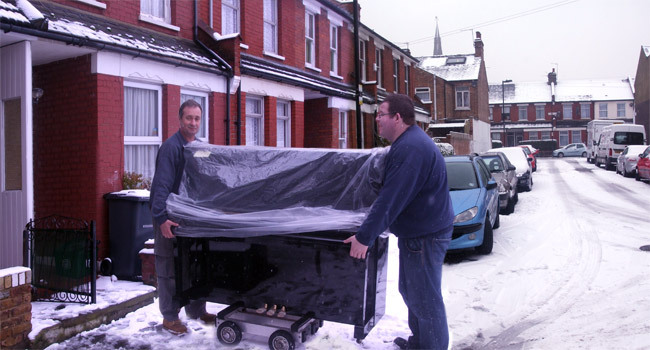 As you would expect from J Reid Pianos, rain or shine, sleet or snow, we deliver whatever the weather. As the weather gets colder and we approach Christmas we become a bit nostalgic and remember some of the more chilling deliveries. Please suggest a caption for the picture below and we’ll pick the best ones to hopefully amuse our website visitors. This entry was posted in J Reid Pianos. Bookmark the permalink. Used to own a 1939 Chapel baby boudoir piano. Sold when I moved to London in 1997. Have not played since but would like to know if I still could with a bit of arthritis and stiffness. Am prepared to have lessons. Your advice needed on Hire or Buy options. Husband is against piano in case it disturbs him. Would a keyboard be better as I believe they come with headphones (sound can be turned off)? Happy New Year and thank you for your enquiry. I’m sorry to hear about your arthritis, my knowledge on the condition and how playing piano may affect your arthritis is limited, however I would be interested to know if any of our other website visitors could offer you advice regarding playing piano with arthritis – please comment or reply if anyone can offer advice. We can supply both upright and grand pianos with a silent system fitted. These pianos have a special mechanism which, when activated, makes the piano virtually silent and it will play through headphones. We have Yamaha silent pianos and there are other brands available. Keyboards and digital pianos can also be supplied from us but we would strongly recommend that you visit us at our piano factory and showrooms in North London before making the final choice between traditional acoustic pianos and digital pianos. Regarding our Hire to Buy options, we offer a scheme aptly names Hire to Buy whereby you hire your piano for6 months and a proportion of the hire fees are set against the purchase price should you decide to buy a piano from us. Please call us for full details on 020 8800 6907. Kind regards from all at J Reid Pianos.